Osteoarthritis (OA), or degenerative joint disease, affects over 30 million Americans. It is a progressive joint problem that leads to breakdown and loss of cartilage, formation of bone spurs and degenerative tearing of meniscus. These changes cause pain, stiffness and loss of joint function. There has been no way to reverse the degenerative changes of osteoarthritis – until now! Regenerative Orthopedics is a new field of medicine that enables a patient to harness and amplify their own body’s ability to heal itself using concentrated regenerative cells and growth factors. Stem cells are at the center of regenerative orthopedics and their use has continued to expand and gain mainstream exposure over the past decade. Many orthopedic conditions involve a failed healing response that leads to continued inflammation, pain and loss of function. This is especially true of osteoarthritis and tendonitis because cartilage and tendon tissue have extremely limited blood flow. Without sufficient blood flow, these tissues do not receive the proper nutrients, growth factors and cells required to mount a proper healing response. Stem cell therapy is a cutting-edge procedure that delivers concentrated cells and growth factors right to the point of injury and stimulates a powerful healing response capable of regenerating and repairing tissue. 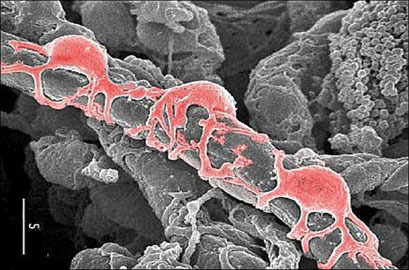 Stem cells, pictured in red, are attached to blood vessels. Mesenchymal Stem Cells (MSCs) are remarkable cells located in many tissues of your body. One of the most important characteristics of MSCs is that they are unspecialized cells with the ability to mature and differentiate into multiple types of tissue including bone, tendon, ligament, cartilage, muscle, and meniscus. In addition, these stem cells can self-renew, producing more stem cells. They can even prevent other cells from dying due to lack of oxygen and they can produce anti-inflammatory proteins. When stem cells are injected into an arthritic joint or injured tendon, they attach to the areas of damaged tissue. The Mesenchymal Stem Cells are able to sense the microenvironment of the injury and determine what kind of cells to grow and what molecules are needed to enhance tissue healing. The stimulated MSCs begin to grow new cells and also act as your body’s own natural drug store producing and releasing the right combination of growth factors and proteins to stimulate healing and new growth of cartilage, tendon and other injured tissues. Why Consider Having Stem Cell Therapy? Osteoarthritis is a progressive degenerative problem without a cure. Over time, the thickness of cartilage that cushions joints continually decreases. In addition to significant potential side effects, typical treatment options for OA do nothing to restore cartilage or correct the problem. Repetitive steroid injections can actually worsen arthritis. The goal of stem cell therapy for arthritis is to reduce pain and improve function by regenerating cartilage tissue and reversing some of the damage in the joint. Many patients choose stem cell because they want to restore lost cartilage and delay worsening of their arthritis. Some choose stem cell because conventional treatments with NSAIDs, steroids or viscosupplements (Synvisc, Euflexxa, Supartz) have failed to provide adequate relief. For others who are looking to avoid surgery, prolong the need for surgery or who are not good candidates for surgery, stem cell therapy provides a great treatment alternative. Other patients choose stem cell to treat tendon/ligament injuries, plantar fasciitis or meniscus tears that have failed improvement with conventional treatment. Why Use Stem Cells from Fat Instead of Bone Marrow? Bone marrow was the first body tissue used to obtain stem cells. Recently, however, fat tissue (adipose) has become the preferred source of stem cells for multiple reasons. Adipose tissue is one of the richest sources of stem cells with over 500 times more concentration of stem cells than bone marrow. In addition, stem cells from bone marrow age faster than those from adipose tissue and, therefore, are less effective as you age. Obtaining stem cells from fat is a simple procedure with minimal discomfort. Bone marrow aspiration is more invasive and painful. Plus, most patients have at least a little extra fat sitting around that they wouldn’t mind losing! How do I know if I am a candidate for Stem Cell Therapy? If you are suffering from joint pain because of osteoarthritis, tendonitis, torn tendon, ligament injury, meniscus or labral injury, or cartilage defect, you are a candidate for stem cell therapy. You are also a candidate if you want to restore joint cartilage and delay worsening of arthritis. There is no age limit for this procedure. Following an evaluation including discussing your history, performing a physical exam and reviewing x-rays and potential advanced imaging, a determination can be made whether or not stem cell therapy is an appropriate treatment option for you.You may not be a good candidate for stem cell therapy if you are currently being treated for cancer, have an active infection, take high dose Coumadin (warfarin) or have multiple medical issues. Dr. Steve Meyers does not perform stem cell injections into the spine for back or neck pain. Fat tissue with stem cells, which rise to the top while being resized and cleansed. Fat derived stem cells, ready for injection. Stem cell therapy is a simple, non-surgical, 3-step process performed in the office setting with local anesthesia (you are not put to sleep). Obtain the fat tissue (usually from the lower belly or love handles): After cleaning and numbing the skin, a thin instrument is inserted into the fat layer. The fat layer is then injected with saline and anesthetic (numbing medicine). Once numb, a thin tissue harvester is inserted and the fat is collected by lipo-aspiration. This takes only a few minutes and is virtually painless. About 3-4 tablespoons are removed, not enough to make a significant cosmetic difference. Fat tissue processing: The fat is transferred to a sterile device that gradually reduces the size of the fat clusters. The tissue is exposed to mild mechanical forces that further break up the fat tissue while maintaining the native microenvironment. The tissue is rinsed with sterile saline to remove blood and oil residues. The stem-cell injection is prepared from this remaining tissue. Injection of stem cells into the joint or damaged tissue: All injections are performed using ultrasound guidance to ensure accurate delivery of the stem cell therapy to the area of injury. 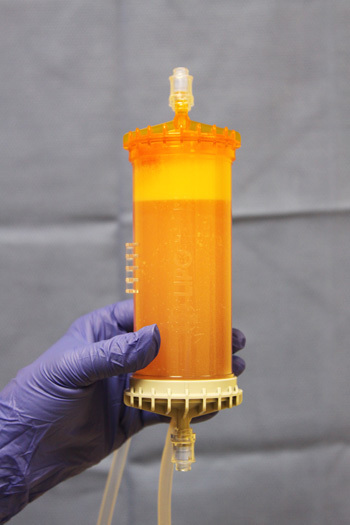 Depending on location, topical or injected anesthetic may be used to decrease injection pain. The whole procedure takes about two hours. You will go home the same day. The procedure is done under local anesthetic to minimize any discomfort. Most patients tolerate the procedure very well and with minimal pain. The area of fat harvesting may bruise significantly. For the first two to three days after the procedure, the joints or areas injected typically become swollen, stiff and painful. It can be difficult to get around these first few days. You do not have to sit around the house all day, but most patients will not feel like walking around the mall or exercising. You will be given a prescription for pain medicine to help with these early symptoms. Typically, four to seven days after procedure you can resume normal activities. You will be instructed to begin a home exercise program to enhance treatment results. NSAID medications such as ibuprofen, Advil, Motrin, Aleve, Celebrex and Mobic need to be avoided ideally for eight to 10 weeks after procedure as they can block the regenerative process. Improvement after stem cell therapy does not happen overnight. Growing new cells and healing tissue take time. Most patients see mild improvement at one month. But, significant improvement can take two to three months and sometimes longer. Research and clinical data show that stem cell therapy is extremely safe with minimal risk for any adverse reaction or complication. Because the injected cells are produced from your own body, there is no concern for rejection or disease transmission. There is a small risk of infection from any injection or lipo-aspiration, but this is very rare. What is the success rate of Stem Cell Therapy? Multiple clinical research papers conclude that stem cell treatment significantly improves pain and function in addition to increasing cartilage volume and quality on MRI imaging. According to published research, stem cell therapy for knee arthritis results in 58-68% improvement in pain and 67-83% improvement in function one to two years after treatment. Most of this improvement occurs in the first three to six months. Tendon and other soft tissue injuries can respond even better. Studies describing longer-term success with stem cells are currently unavailable. Hopefully, stem cell treatment will provide multiple years of improvement, if not a permanent cure. Does my insurance pay for Stem Cell Therapy? The cost of stem cell therapy is $4,000 for a single joint or injury. Additional joints/injuries can be treated at the same time for as little as $800. Paying more for stem cell therapy does not mean that it will work better! Outcome is dependent on multiple factors including having the correct diagnosis, proper harvesting technique, processing that maximizes growth factor and stem cell potential and, of course, accurate delivery to the site of injury. Fodor PB, Paulseth DG. Adipose derived stromal cell (ADSC) injections for pain management of osteoarthritis in the human knee joint. Jo CH, Lee YG, Shin WH, Kim H, et al. Intra-Articular Injection of Mesenchymal Stem Cells for the Treatment of Osteoarthritis of the Knee: A Proof-of-Concept Clinical Trial. Koh YG, Jo SB, Kwon OR, Suh DS, Lee SW, Park SH, Choi YJ. Mesenchymal Stem Cell Injections Improve Symptoms of Knee Osteoarthritis. Orozco L, Munar A, Soler R, Alberca M, et al. Treatment of Knee Osteoarthritis With Autologous Mesenchymal Stem Cells: A Pilot Study. Pers YM, Ruiz M, Noël D, Jorgensen C. Mesenchymal stem cells for the management of inflammation in osteoarthritis: state of the art and perspectives. Ruiz M, Cosenza S, Maumus M, Jorgensen C, Noël D. Therapeutic application of mesenchymal stem cells in osteoarthritis. Expert Opin Biol Ther. 2016;16(1):33-42. Vangsness CT, Farr J, Boyd J, Dellaero DT, Mills CR, LeRoux-Williams M. Adult human mesenchymal stem cells delivered via intra-articular injection to the knee following partial medial meniscectomy: a randomized, double-blind, controlled study. J Bone Joint Surg Am. 2014;96(2):90-8. Xia P, Wang X, Lin Q, Li X. Efficacy of mesenchymal stem cells injection for the management of knee osteoarthritis: a systematic review and meta-analysis.